The cornet is a brass instrument very similar to the trumpet, distinguished by its conical bore, compact shape, and mellower tone quality. The most common cornet is a transposing instrument in B?. It is not related to the renaissance and early baroque cornett. The cornet was initially derived from the post horn around 1820 in France. Among the first manufacturers of modern cornets was Parisian Jean Asté in 1828. Cornets first appeared as separate instrumental parts in 19th century French compositions. This instrument could not have been developed without the improvement of piston valves by Heinrich Stölzel and Friedrich Blühmel. In the early 19th century these two instrument makers almost simultaneously invented the valves still used today. They jointly applied for a patent and were granted this for a period of ten years. The first notable virtuoso player was Jean-Baptiste Arban, who studied the cornet extensively and published La grande méthode complète de cornet à piston et de saxhorn, commonly referred to as the Arban method, in 1864. Up until the early 20th century, the trumpet and cornet coexisted in musical ensembles. Symphonic repertoire often involves separate parts for trumpet and cornet. As several instrument builders made improvements to both instruments, they started to look and sound more alike. The modern day cornet is used in brass bands, concert bands, and in specific orchestral repertoire that requires a more mellow sound. 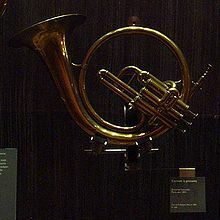 The name cornet derives from corne, meaning horn, itself from Latin cornus. While not musically related, instruments of the Zink family (which includes serpents) are named “cornetto- ” with a tonal or pitch related Latin word following the hyphen to describe the particular variant. The 11th edition of the Encyclopædia Britannica referred to serpents as “old wooden cornets”. The Roman/Etruscan cornu (or simply “horn”) is the lingual ancestor of these. It is a predecessor of the post horn from which the cornet evolved and was used like a bugle to signal orders on the battlefield. The instrument was once sometimes referred to as a cornopean, referencing the earliest cornets with the Stölzel valve system. The cornet was invented by adding valves to the post horn in 1814. The valves allowed for melodic playing throughout the register of the cornet. Trumpets were slower to adopt the new valve technology, so for the next 100 years or more, composers often wrote separate parts for trumpet and cornet. The trumpet would play fanfare-like passages, while the cornet played more melodic passages. The modern trumpet has valves that allow it to play the same notes and fingerings as the cornet. Cornets and trumpets made in a given key play at the same pitch, and the technique for playing the instruments is nearly identical. However, cornets and trumpets are not entirely interchangeable, as they differ in timbre. Also available, but usually seen only in the brass band, is an E♭ soprano model, pitched a fourth above the standard B♭. Unlike the trumpet, which has a cylindrical bore up until the bell section, the tubing of the cornet has a mostly conical bore, starting very narrow at the mouthpiece and gradually widening towards the bell. Cornets following the 1913 patent of E.A. Couturier can have a continuously conical bore. The conical bore of the cornet is primarily responsible for its characteristic warm, mellow tone, which can be distinguished from the more penetrating sound of the trumpet. The conical bore of the cornet also makes it more agile than the trumpet when playing fast passages, but correct pitching is often less assured. The cornet is often preferred for young beginners as it is easier to hold, with its center of gravity much closer to the player. The cornet mouthpiece has a shorter and narrower shank than that of a trumpet so it can fit the cornet’s smaller mouthpiece receiver. The cup size is often deeper than that of a trumpet mouthpiece. Short model traditional cornet, also known as a “Shepherd’s Crook” shaped model. Short model traditional cornet, also known as a “Shepherd’s Crook” shaped model (Webster’s Dictionary 1911). One variety is the short model traditional cornet, also known as a “Shepherd’s Crook” shaped model. These are most often large–bore instruments with a rich mellow sound. There is also a long-model cornet, usually with a smaller bore and a brighter sound, which is closer to a trumpet in appearance. The Shepherd’s Crook model is preferred by cornet traditionalists. The long-model cornet is generally used in concert bands in the United States, but has found little following in British-style brass and concert bands. The echo cornet is an obsolete variant which has a mute chamber (or echo chamber) mounted to the side acting as a second bell when the fourth valve is pressed. The second bell has a sound similar to that of a harmon mute and is typically used to play echo phrases, whereupon the player imitates the sound from the primary bell using the echo chamber. Connie Jones playing a long-model cornet. Like the trumpet and all other modern brass wind instruments, the cornet makes a sound when the player vibrates (“buzzes”) the lips in the mouthpiece, creating a vibrating column of air in the tubing. The frequency of the air column’s vibration can be modified by changing the lip tension and aperture or “embouchure”, and by altering the tongue position to change the shape of the oral cavity, thereby increasing or decreasing the speed of the airstream. In addition, the column of air can be lengthened by engaging one or more valves, thus lowering the pitch. Double and triple tonguing are also possible. Without valves, the player could only produce a harmonic series of notes like those played by the bugle and other “natural” brass instruments. These notes are far apart for most of the instrument’s range, making diatonic and chromatic playing impossible except in the extreme high register. The valves change the length of the vibrating column and provide the cornet with the ability to play chromatically. British style brass band ensembles consist completely of brass instruments (except for the percussion section). The cornet is the leading melodic instrument in this ensemble and trumpets are never used. The ensemble consists of about thirty musicians, including nine B♭ cornets and one E♭ cornet (soprano cornet) in the higher registers. In England, companies such as Besson and Boosey and Hawkes specialized in these instruments. In America, 19th century manufacturers such as Graves and Company, Hall and Quinby, E.G. Wright and the Boston Musical Instrument Manufactury built lines of instruments for this format of ensemble. The cornet also features in the British-style concert band, unlike the American concert band or wind band, where it is replaced by the trumpet. This slight difference in instrumentation derives from the British concert band’s heritage in military bands, where the highest brass instrument is always the cornet. There are usually four to six B? cornets present in a concert band, but no E? instrument, as this role is taken by the E? clarinet. Fanfare orkesten (“fanfare orchestras”), only found in the Netherlands, Belgium, Northern France and Lithuania use the complete sax horn family of instruments. The standard instrumentation includes both the cornet and the trumpet; however, in recent decades, the cornet has largely been replaced by the trumpet. In old style jazz bands the cornet was preferred to the trumpet, but from the swing era onwards it has been largely replaced by the louder, more piercing trumpet. Likewise the cornet has been largely phased out of big bands by a growing taste for louder and more aggressive instruments, especially since the advent of bebop in the post World War II era. Legendary jazz pioneer Buddy Bolden played the cornet, and Louis Armstrong started off on the cornet but later switched to the trumpet. Cornetists such as Bubber Miley and Rex Stewart contributed substantially to the Duke Ellington Orchestra’s early sound. Other influential jazz cornetists include King Oliver, Bix Beiderbecke, Ruby Braff and Nat Adderley. Notable performances on cornet by players generally associated with the trumpet include Freddie Hubbard’s on Empyrean Isles by Herbie Hancock and Don Cherry’s on The Shape of Jazz to Come by Ornette Coleman. Ernest S. Williams, Cornet soloist with Sousa, Conway and Goldman Bands, and famed educator. Also Principal Trumpet with The Philadelphia Orchestra. Del Staigers, cornet and trumpet soloist with Sousa, Conway and Goldman Bands. Nat Adderley, jazz artist and brother of the famous alto saxophonist Cannonball Adderley. Jean Baptiste Arban, one of the most influential cornet performers and pedagogue. Louis Armstrong, arguably the best known cornet player, also a skilled trumpet player and singer, and one of the most influential artists in the history of jazz and American music. Buddy Bolden, often considered the father of jazz, but his playing is unrecorded. James F. Burke, the last celebrated cornet soloist of the 20th century. 32-year tenure as soloist with The Goldman Band. Had use of only 1 arm – his left. Don Cherry (jazz), was one of the major innovators of the free jazz, and world music pioneer, famous for his work with Ornette Coleman; also a proponent of the pocket trumpet. Herbert Lincoln Clarke, one of the finest cornet soloists and band leaders at the turn of the 20th century. David B. Dana (1855–1917), lead cornetist in Issler’s Orchestra and soloist. Often played fanfares. Solo records usually had fellow musician, pianist Edward Issler, backing him up. W.C. Handy, influential composer and band leader, has been called the “Father of the Blues”. Bohumir Kryl, soloist with John Philip Sousa and founder/conductor of leading concert band. Red Nichols, cornettist, composer and jazz band leader. Joe “King” Oliver, the first important recorded jazz cornetist, he greatly influenced Louis Armstrong, who played in his band. James Shepherd, legendary Principal Cornet player of the world-famous Black Dyke Band during its most prize-laden years. A. J. Turner, first director of the Stonewall Brigade Band, prominent professor in Staunton, Virginia. Bobby Bradford, solo jazz recording artist and musical associate of saxophonist Ornette Coleman and clarinetist John Carter. Mark Charig, British cornetist and trumpeter, played with Centipede and King Crimson. Philip Cobb, principal trumpet of the London Symphony Orchestra and principal cornet of the Hendon Band of The Salvation Army. Jim Cullum, Jr., jazz musician and preservationist of Dixieland. Olu Dara, jazz musician and father of noted rapper Nas. Dave Douglas, New York based jazz musician and composer, with a long association with John Zorn’s Masada. Digby Fairweather, leader of Digby’s Half Dozen, frequent accompanists to Paul Jones and George Melly. Clifton Hyde, musician in the Blue Man Group. Robert Schulz – a cornetist who played with the legendary Turk Murphy before leading his own Frisco Jazz band. Bill Taft, American cornetist, lead singer and guitarist, played with Benjamin Smoke in Atlanta’s Smoke (band). Has appeared as cornetist on songs by The Indigo Girls and currently fronts eccentric Atlanta band Hubcap City. Mark Roberts is a Salvationist bandsman that is principal cornet in the Sydney Youth Band, Parramatta Salvation Army citadel band & recent addition to the cornet bench in Sydney Salvation Brass. Roger Webster, Principal cornet player of Grimethorpe Colliery Band and formally, Black Dyke Band. Daniel Rollston, Principal cornet of Murley Silver Band.